Make ground signal last longer? Hi everyone! I'm currently working on retrofitting a Factory Keyless Entry system in my car, that didn't come with a Factory Keyless Entry system. I'm happy to say that I did get it working correctly. When you hit the lock button on the key fob the doors lock and you hit the unlock button it unlocks the car. The locks use a Negative trigger to activate the door locks. The lock and unlock wires both have 12V constant power and when you hit the button on the key fob it sends a ground signal that drops the voltage to 0V. The main issue I'm having is the arming the theft system. In order to activate/arm the theft system you have to hit the lock button while the door is open, then close the door. It would be nice to arm the theft alarm with the door closed like a normal car. All of this is tied into the door switch...it's a two wire pin switch that you when you close the door it pushes the switch/pin in and when you open the door it springs the pin out. When the door is open the switch/pin is grounded...has 0V, when the door is closed it gets 12V constant. What I have done so far is... I used a jumper wire to connect the door lock wire to the door switch wires. Then I placed a 1n4001 diode in the jumper wire that way it only supplies a ground signal to the door switch. What this is doing is tricking the car into thinking the door is open when I hit the lock button to arm the theft system. The only issue is that it takes atleast 2-3 seconds for the theft alarm system to arm but my ground signal is only lasting half a second when I hit the lock button on the remote. To sum everything up and make a long story short. Door locks use a negative trigger to activate..they have 12V constant power, then you hit the button on the fob it sends a ground signal 0V for half a second. Door switch has 0V when open...12V when closed. I used a wire with a diode to connect the door lock wire to the door switch wires to only pass the ground and not voltage. Is there a relay or something I can use to make the ground signal last longer? Like a On/Off/On? Door closed...Door switch has 12V, I hit the lock button, it sends the 0V ground to trigger something to cut voltage for 2-3 seconds then return back to 12V? Any help would be greatly appreciated. I wouldn't know what I need to make this happen. Thank you for you time! I'm struggling to get my head round the wiring you describe, but it seems like a simple timer would do the trick. 555 is the go-to choice, but I've seen some timer modules on Ebay recently, I don't know if it's a 555 in disguise or something else, which might serve https://www.ebay.co.uk/itm/10Pcs-Mu...265105&hash=item3f63b64e14:g:InAAAOSwMkJaWI5o less flexible but easier to use. You might need some kind of output device like a transistor or small relay. Thanks for the replay throbscottle, I probably should have made it less complicated. I'm using negative ground signal from the lock wire to drop the 12V from the door switch to 0V or ground for 3 seconds but I can only get it to last half a second. It says operating voltage 2-5V if I used the lock wire which has 12V for power would that be too much voltage to power it? I think I might have solved the issue. I going to go with this 10 second time delay relay, which will delay the ground for 10 seconds before switching it on. I'll know in a few days if this works out. isolated switches all have input & output conditions for impedance, voltage , current. and time. These make it possible to analyze any solution. So a simple solution might be a diode and cap or not. or use the chassis door 0V as a reference. but we don't know from your description. good luck. I believe the door switch has constant 12V power going to it and it's grounded using the car's body. When the door is open the switch is grounded(Red car door open light is on) when the door is closed(or switch pushed in) it gets 12V constant and the Red door open light is off on the dash. 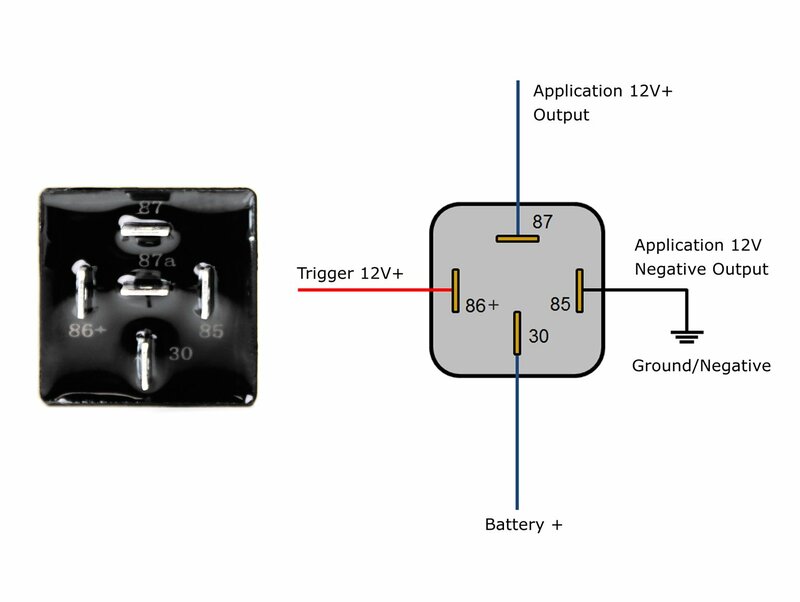 Sorry for the Double post, I will hook it up just like the diagram above and if the 12V+ trigger doesn't work like above, I will use a jumper wire and connect the Battery + and Trigger 12V+ wires together so when I hit the lock button it will drop the 12V down to ground for a quick second and reset the 10 second relay. This would be like unplugging the relay and plugging it back in..but in this case I'm using the lock wire to ground it for a quick second and giving it back the 12V to create the trigger.